The star is the 2,652nd since the completion of the Walk of Fame in 1961. 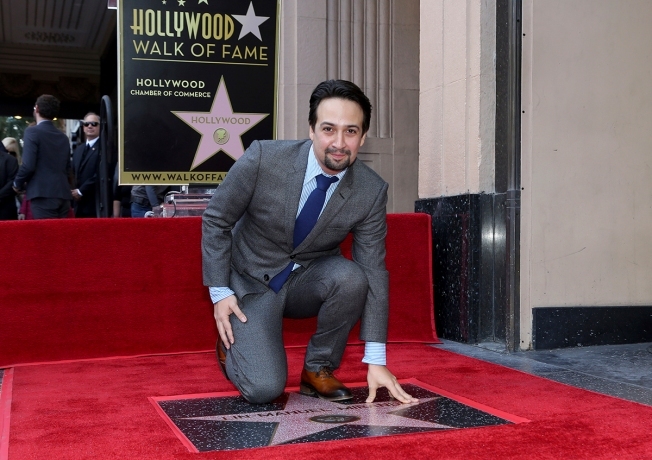 Lin-Manuel Miranda added a Hollywood Walk of Fame star to his list of honors on Friday, which also include three Tony Awards, three Grammys, an Emmy and a Pulitzer Prize. "I feel like I'm dreaming," Miranda told the cheering crowd at the ceremony outside the Pantages Theatre, which hosted performances of his famed musicals "In the Heights" and "Hamilton." "My first job in L.A. was in this theater," he said. "I played Usnavi in 'In the Heights' in the first national tour. I lived at the W across the street. I ate at the Waffle House down the street from there. "It's funny I grew up in New York City ... and so my first interaction with the Hollywood Walk of Fame was honestly when people passed away. ... You would see flowers being left on the stars when someone had a passing or an untimely passing. ... It was a distant thing from somewhere else from possibly accomplished people and a way for every day fans to honor them and pay their love and tribute to them. And so flash-forward to me performing in this incredible theater -- and it means the world to me that my star is outside this theater because I love it so much. 'In the Heights' and 'Hamilton' were both here." Miranda thrilled the crowd by belting out part of a song from "In the Heights," including the line "reports of my fame are greatly exaggerated." "Reports of my fame are still probably greatly exaggerated," he said. "But the fact that there's a star marking where I got to say these lines, I cannot tell you what a dream come true that is for me." Song parodist "Weird Al" Yankovic and actress-singer Rita Moreno were among those joining Miranda at the ceremony, which came 19 days before the release of "Mary Poppins Returns," which co-stars Miranda. The star is the 2,652nd on the famed walk. In addition to creating and starring in "Hamilton" and "In the Heights," Miranda also co-wrote the songs for the soundtrack for the 2016 animated musical adventure "Moana," was the co-composer and co-lyricist for Broadway's "Bring It On: The Musical," and wrote the Spanish translations for the 2009 Broadway revival of "West Side Story." Miranda received Tony Awards for best original score for "Hamilton" in 2016 and "In the Heights" in 2008 and best book of a musical for "Hamilton." Miranda won best musical theater album Grammy Awards in 2016 for "Hamilton" and 2009 for "In the Heights," and a best song written for visual media Grammy in 2018 for "How Far I'll Go" from "Moana." Miranda shared an outstanding original music and lyrics Emmy with Tom Kitt in for "Bigger'' from the 67th Tony Awards. Miranda received outstanding guest actor in a comedy series Emmy nominations in 2017 for hosting "Saturday Night Live" and in 2018 for portraying himself on the HBO comedy "Curb Your Enthusiasm." Miranda won the 2016 Pulitzer Prize for drama for "Hamilton," which was inspired by his reading Ron Chernow's 800-page biography about the first treasury secretary while on vacation in Mexico in 2008. Miranda is an Oscar away from completing an "EGOT." He received a best original song nomination in 2017 for "How Far I'll Go," losing out to Justin Hurwitz, Benj Pasek and Justin Paul for "City of Stars" from "La La Land."